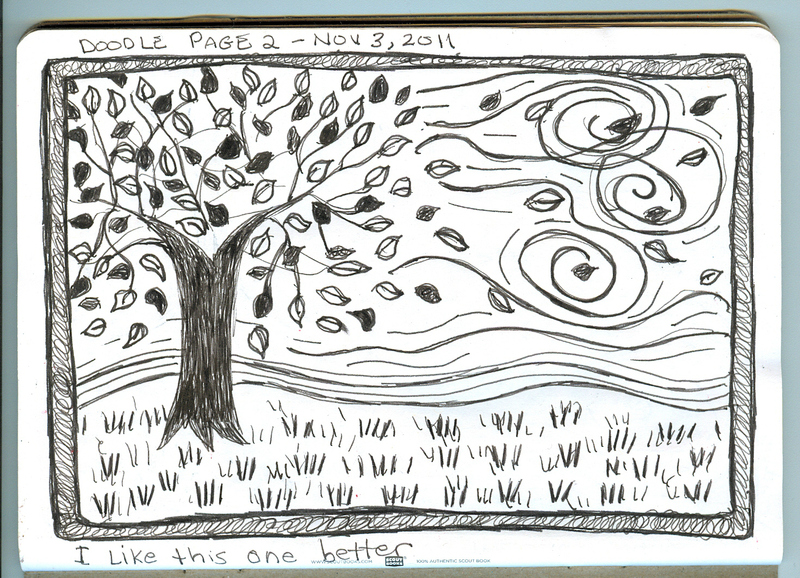 These are more doodles than realistic representations of a tree, leaves, and branches. 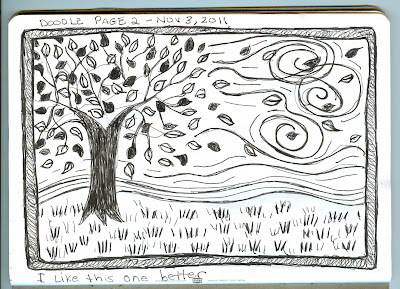 I had two pages left in my Sketchbook Project 2010 sketchbook and some time to kill so I started drawing the above doodle. 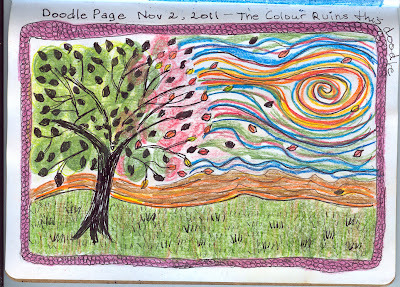 I liked it in the simple pen & ink lines but decided to add colour to it with coloured pencils. I had an idea in my head, but it did not translate into reality, as I saw it in my mind's eye. I immediately regretted adding colour and hated it. 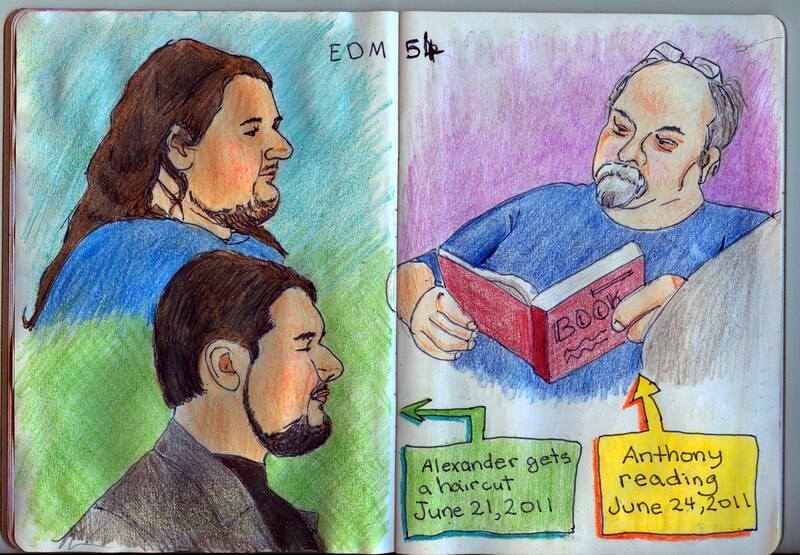 So, I redrew the image (more or less) on the last page of my sketchbook, as you see below. Initially, I liked the black and white one better. However, when I scanned these onto my computer a month had passed between the time I had created these and the time I scanned them in. Now, I like them both. I like the coloured one just fine. Neither of these are in my usual, realistic, style. They are more whimsical than I normally draw. 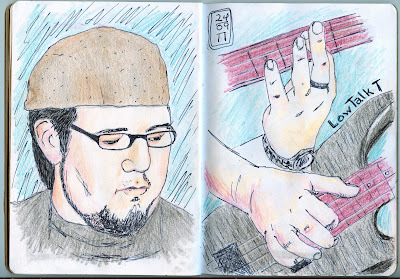 As it is, most of the work in this sketchbook, although fairly accurate representations, are not in my usual "finished", "tight" style that I use for larger pieces and commissioned work. I purposely decided to keep things "loose" and casual in this sketchbook. 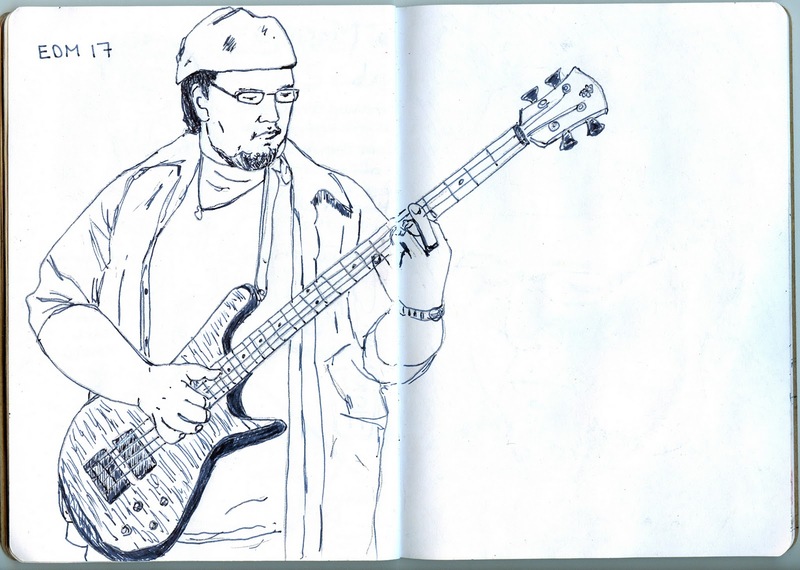 For the most part, most of my sketchbooks, are filled with loose lines and raw drawings. 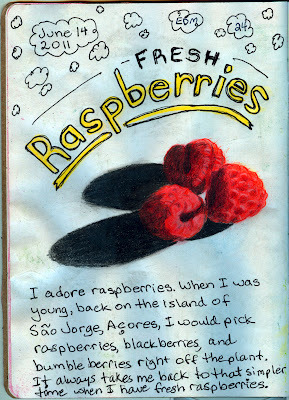 I use my sketchbooks to work out ideas, capture moments, and relax. I leave my more detailed, finished, work for larger pieces that are either commissioned or are meant for display at an art show and for sale. My sketchbook work is not meant for public display or art shows (although I do have a sketchbook blog that I do show my rough work, for those who are interested -- currently it is mirroring this site with the Sketchbook Project 2012, but normally it stands on its own). 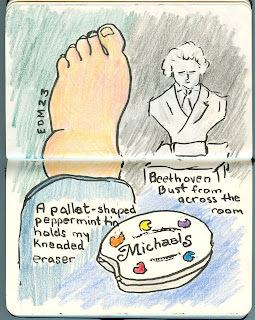 This is the 3rd to last post about the Sketchbook Project 2012. I will have one post showing all the work together, and then one last post when my sketchbook is up on The Art House Coop site, with tour dates. Near the beginning of 2011 I woke one morning with the feeling that I slept on my arm funny. There was stiffness in my left arm, radiating to my jaw and back. I did not think of anything of it. I often wake up with stiff joints that get better with movement in a few hours. However, as time went, my arm was in more and more pain. It got to the point, a few months later, that I could no longer move it. I went to emerge and urgent care a few times and was told I had a torn rotator cuff. Pain medication was not having much effect. My doctor sent me for ultrasound. The ultrasound showed my rotator cuff was fine. I had what is known as frozen shoulder. Yes, I know I should have had my arm checked out sooner, but at this time my husband was going through some pretty serious health issues, himself, and it did not seem the right time to be out of commission, myself. I also kept hoping it would just get better on its own. 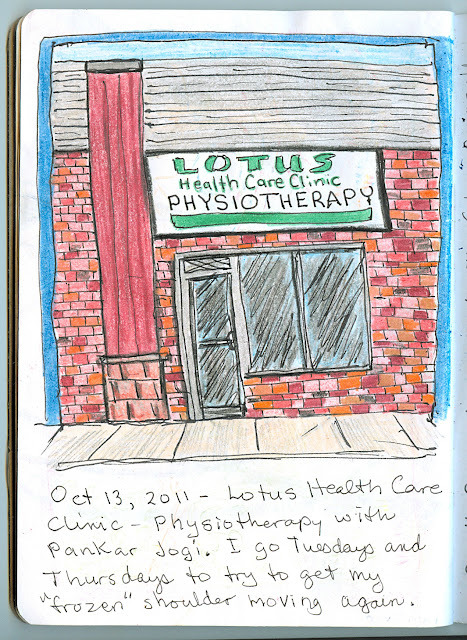 I started physiotherapy with Pan at Lotus Health Care Clinic. Pan is amazing. He is a very pleasant person too. He laughs at my corny jokes. The physio is extremely painful, however, it is working. We had a set back when I fell in the kitchen two weeks into the therapy. I had been carrying something into the kitchen and my ankle gave out. I fell hard on my arm. Pan was very patient with me and quickly got me back on schedule. I now have full mobility back, although it is still painful. I am working on strength now. My arm is still weak, but getting better and better. 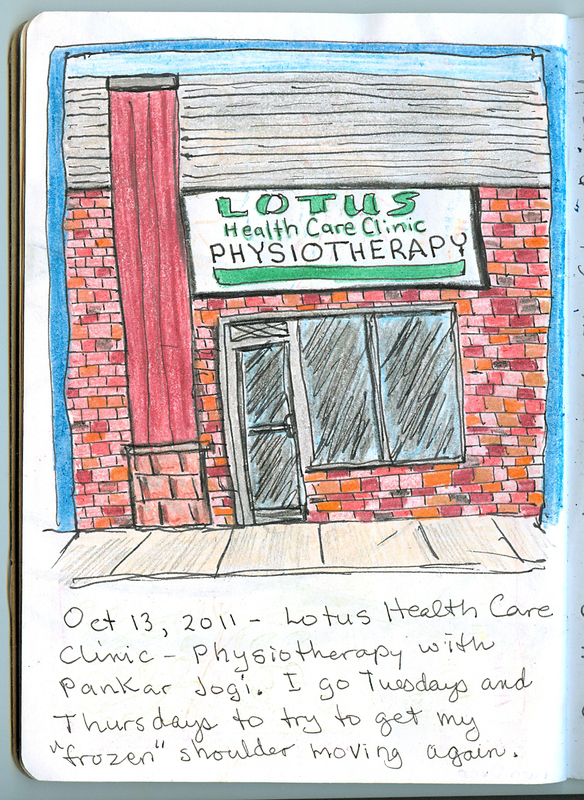 The drawing of the building was done one morning while I waited for the clinic to open. I usually get there 15 minutes before they open and I sit and have a coffee and get caught up on my internet reading (using instapaper on my ipod). 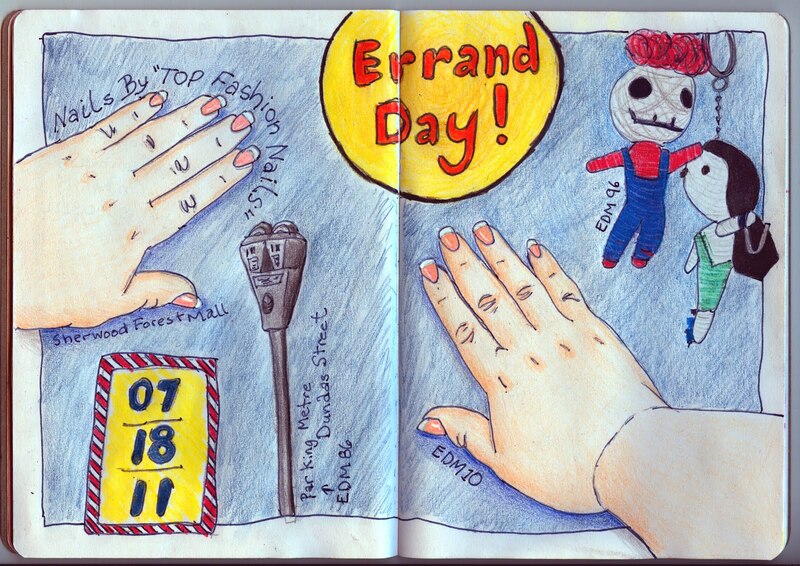 This day I happened to have my Sketchbook Project 2012 sketchbook with me and decided to do a quick drawing while I waited. This was done in about 15 minutes, while sitting in my car, parked across from the door. This self portrait was created by looking at a mirror in my lap. I drew it upside down just to make it that more unusual. This was just a quick sketch done with a few scribbles of my pen. You can see the image better when it is right side up. Here they are together so you can see them better. This is not the best drawing I have ever done, but it was fun to do. As much as I hate to admit it, this pretty well looks like what I look like right now. I would have loved to draw me young, svelte, and beautiful, however, that would have been an illusion at best and a lie at worse. One of the inevitable things in life is that we age, and our bodies change as we age. Some people age better than others. Me, I look younger than my age, but I certainly look matronly now. I joke that I look like a Portuguese mother now. Of course, I am a Portuguese mother! The colour red goes beautifully with my olive skin tone. It is a colour I enjoy wearing. The background is organized chaos. That is more or less what my mind and life is like: organized chaos, with little dangler bits to grab a hold of, now and again. Generally speaking, life is good. Here is my son playing one of his bass guitars. 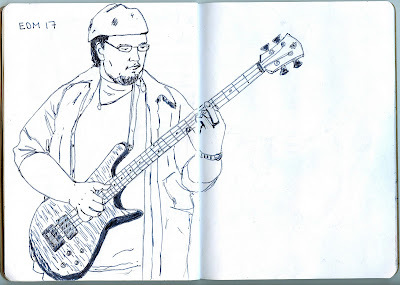 My son has been compared to the wonderful Mr.Victor Wooten (whom h admires) in his playing. Our son is a very talented multi-instrumentalist musician. 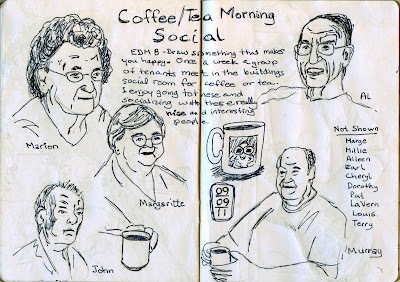 One morning a week several tenants from the apartment building I live in get together for a coffee/tea social. We have a social room where we meet. Most of the people who, except me, are senior citizens. They are a great group of people who are very interesting and pleasant. It really makes me happy to join them for these regular coffees. I only drew 5 of the people. These were the ones that showed up the day I decided to draw. Usually we have a lot more people in the group but that day we only had this small group. This is our beautiful Oscar. Oscar is a cockatiel, which is part of the cockatoo family. He and Anthony are best pals. He loves to come out to play with Anthony every day. He will play with Alexander and me on occasion but Anthony is his favourite. I was originally thinking of doing the above sketch in pen and ink only. 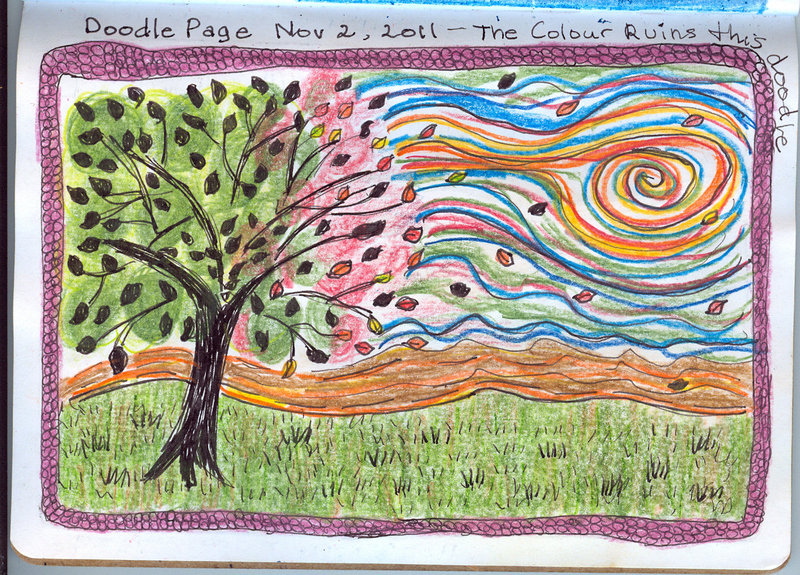 However, Oscar is so colourful I could not help myself: I grabbed my coloured pencils. 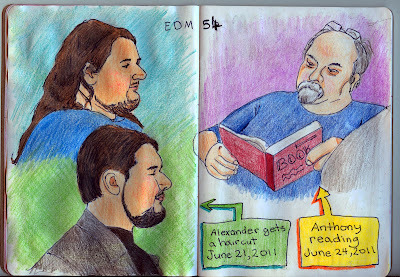 I felt Anthony and Oscar interacting with each other left in line drawings complement the full page of colour. What do you think? Cockatiels are great pets full of personality. They don't talk very much but they can whistle like no one's business! They have an irritating screech when they are annoyed. However, Oscar rarely screeches. He moslty whistles, says "Hey Booboo" and gives lots of kisses. He loves to get neck scritches too, as long as it is Anthony who is doing it. 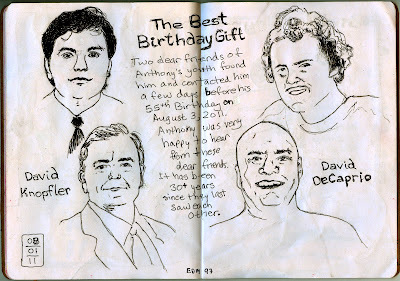 On August 3, 2011 Anthony celebrated 55 years of life. I am modifying EDM 97 (Draw a present you have received. Why is it special?) a little to be gifts that he received rather than gifts I received. Anthony was overjoyed to hear from two dear friends from his past. Over the years he has regaled us with stories about both these friends, and he has tried to find them. 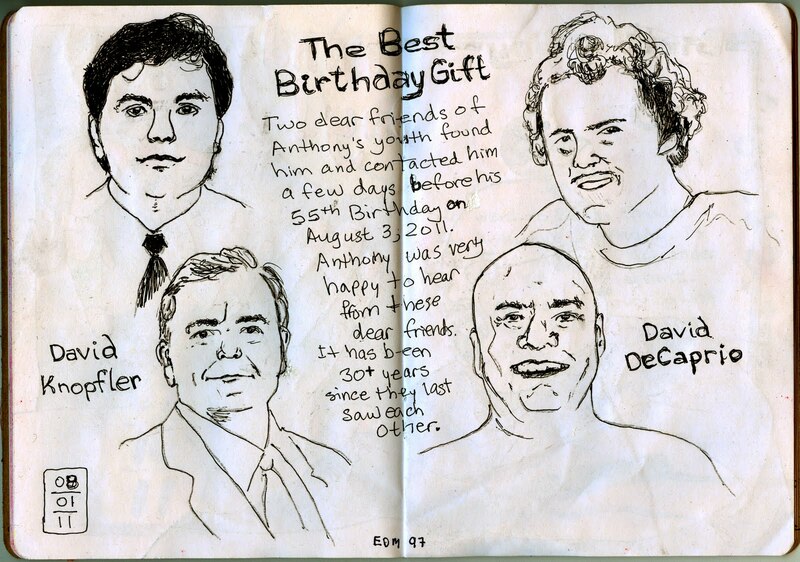 Both of them contacted me through Facebook, to reconnect with Anthony, days before his 55th birthday! This was the best gift he could have received. When initially drawing the above images I had intended to add colour to them. However, when I finished the line drawings I really like them as they are. I debated whether or not to go ahead with the original plan to add colour but in the end I decided to keep them as line drawings. Anthony likes them as line drawing too. 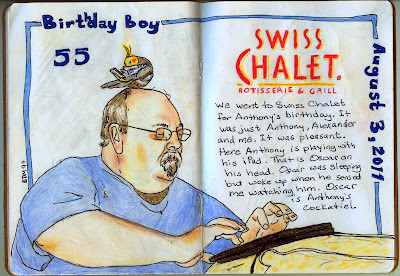 We (Alexander and I) took Anthony to Swiss Chalet on the day of his birthday. There is one walking distance from our home. We had not been in over a year, so it was quite pleasant and a treat. Alexander and I went in together to get Anthony an iPad for his birthday. He is thoroughly enjoying watching movies on it. Anthony has been at home sick for over a month with severe cellulitis in his right leg. It is extremely painful and so it is nice that he has something he can entertain himself with while stretching his leg out on his bed. We also gave Anthony the movie Forbidden Planet in a commemorative tin. Oscar is sitting on Anthony's head here. He had been sleeping with his head tucked under his wing. 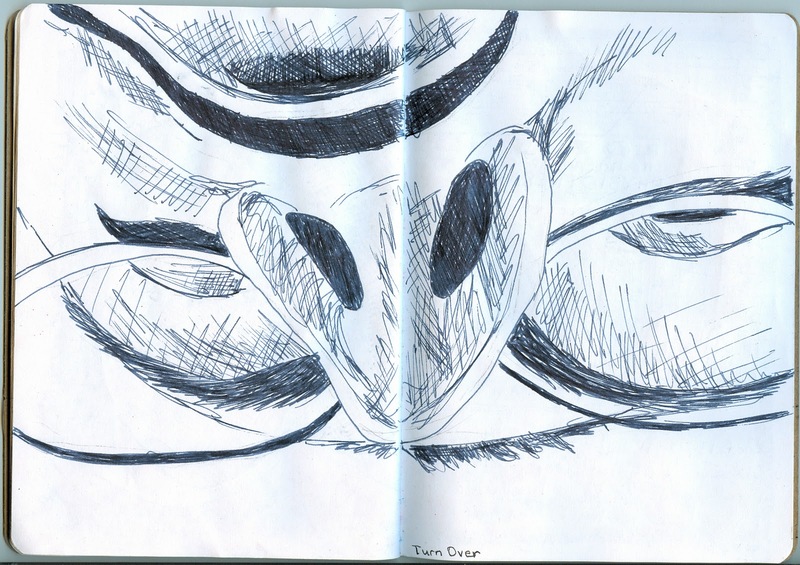 I drew him with his eye open as he was looking at me looking at him. He woke up when he felt me staring at him. Oscar spends a lot of time with Anthony. They are best buds. Oscar likes to sit on Anthony's head when Anthony's hands are busy. Otherwise, Oscar spends his time on Anthony's shoulder, chest, or nearby within Anthony's reach. Oscar is his cockatiel. Every two weeks I have a day called Errand Day where I drive around and do a bunch of errands. The parking metre was a view from my vehicle while I waited for a shop to open. I was in the parking lot but there were metres on the street. The two dangling cuties are hanging off our rearview mirror. They are made of wrapped string. The one with red hair my husband has named Herbunculous and the other one is Pirozingura. These are adorably sweet. Anthony has named them all and makes up stories to go with them. We have 6 of these altogether. I only drew the two. On this Errand Day I also got my nails done. Anthony and I go together to Top Fashion Nails in Sherwood Forest Mall to get our nails done. Anthony gets three nails on his right hand done so that he can play his guitar (He plays fingerstyle guitar). Bill, Lily, and Tammie at Top Fashion nails do a fabulous job on our nails. My nails look wonderful and do not chip or flake at all in the two weeks before getting a fill done. Anthony's nails remain strong and perfect for his guitar playing (and look so natural that you have to really look hard to see they are not). On Canada Day I had a little ornamental flag on a toothpick given to me by the people from our coffee clutch in the building's social room. (We have coffee once a week.) 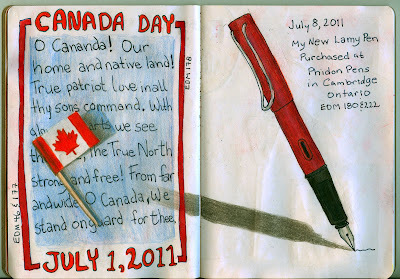 I drew the flag here on top of the words to O Canada (Canada's national anthem). On the facing page is a drawing of my new drawing pen. It is a Lamy. Anthony purchased this for me as a gift. We went to Cambridge, Ontario to a shop called Phidon Pens to purchase this (and some other things). 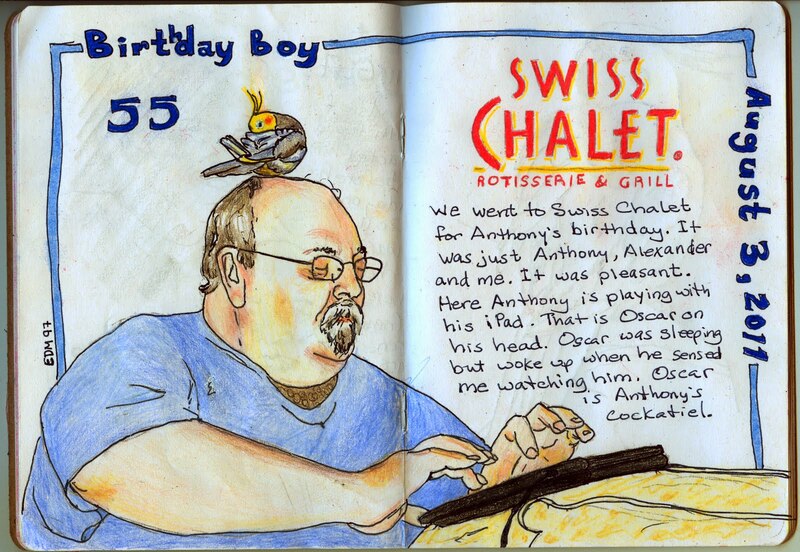 Anthony purchased a new Moleskine sketchbook for me as well. (I have not started using the new sketchbook yet.) I really enjoy using the Lamy and will be using it a lot going forward. I have more than one favourite colour. I really like red, burgundy, mauve, magenta, pink, and purple. Here are two people that I love very much. My son, Alexander had a short haircut for the first time in his life. A couple of years ago he had his first haircut to shoulder length hair. Before that he had hair that went down to his bottom, and he normally wore it in a braid. Here I am showing you a before and after images of his haircut. My husband, Anthony, is sitting on the sofa reading a book. He always wears his glasses on his head when he reads. He was very patient about allowing me to draw him. I will be drawing Anthony again, later in the sketchbook, with Oscar, our cockatiel, on his head. Correction: Oscar, Anthony's cockatiel. This was our first Father's Day without our father, Vasco Fernando Bettencourt. He passed away on July 10, 2010. My family got together at his grave on Father's Day. 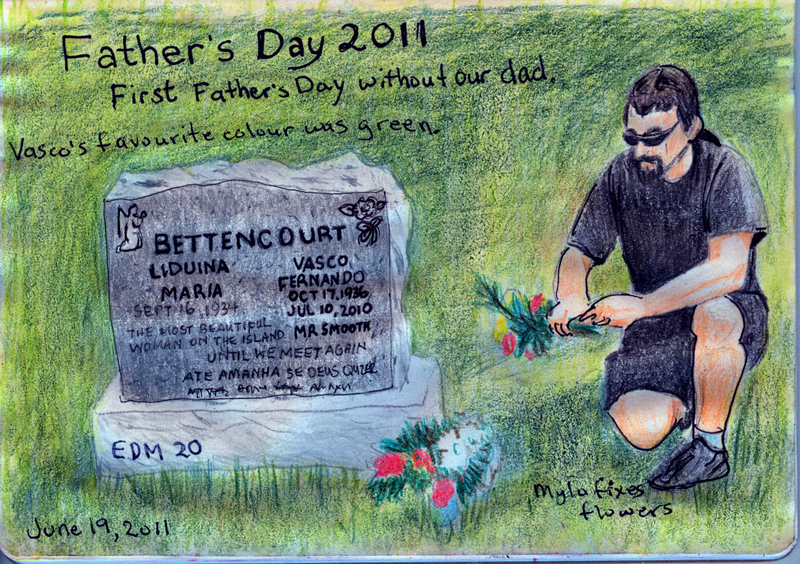 Here I have illustrated his tomb stone with my brother, Mylo, fixing the flowers that are being put by his stone. (My mom eventually planted flowers around the stone). After going to the cemetery we went back to Mylo's home for a small get-together. Dad loved the colour green and red roses. I have made this drawing predominantly green for him. Some of those flowers are supposed to be roses, but I did not do such a good job of drawing them. 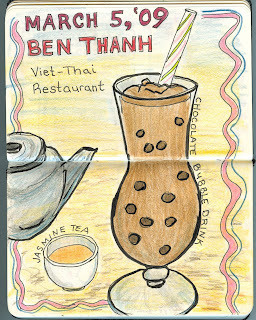 The original drawing is better than this scanned image. Fresh fruit is so delicious. I love it when fruit is in season. EDM 72 - Draw somewhere new. 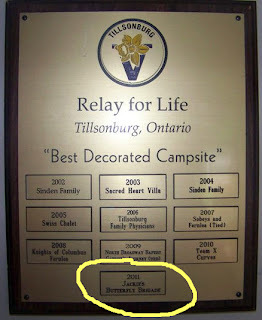 Alexander and I went to Tillsonburg, Ontario for the first time ever on June 10th to support my friend Darylnne McAvany and her family in the Relay for Life 2011 fundraiser. 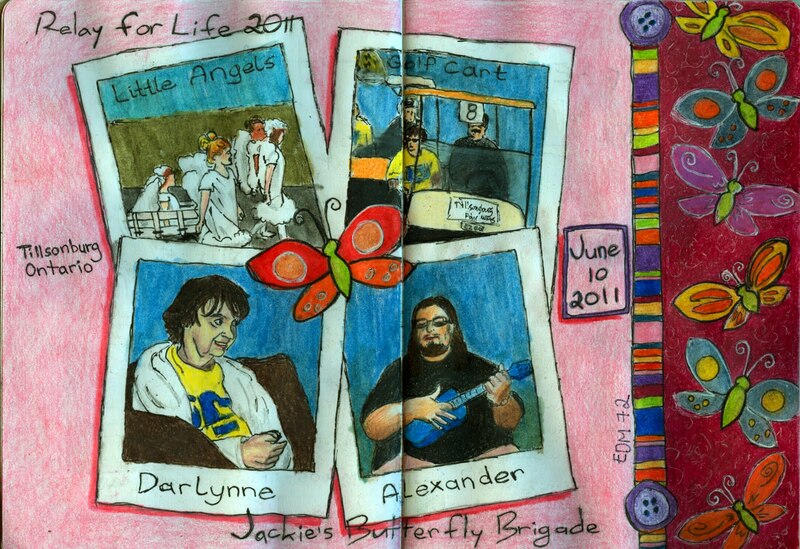 My friend's family fundraise under the banner "Jackie's Butterfly Brigade" in memory of their mother who died of cancer. The above drawings represent our visit. 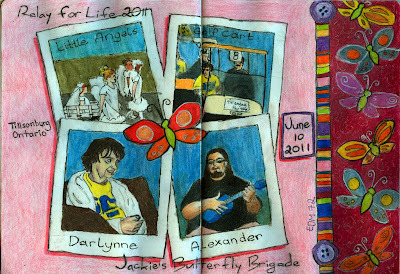 The little angels were in the small parade around the site, then beside that drawing, is Darlynne in a golf cart in same parade. The two bottom drawings are of Darlynne and Alexander at the camp site. Alexander is playing his ukulele and singing for us. It was wonderful to see Darlynne again, and great to meet her sisters and family. The McAvany family have a great banner and display. 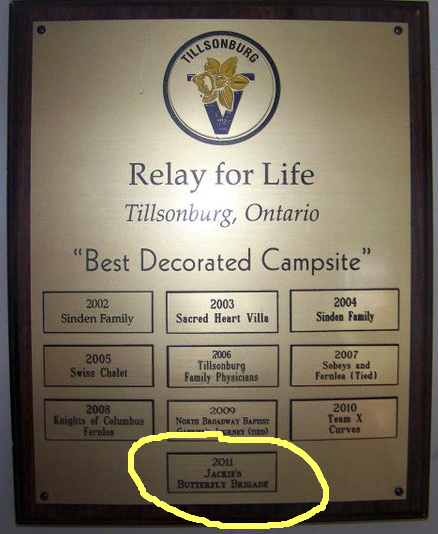 They won best decorated campsite. They also raised quite nice chunk of change for the cause. We met when I went to work for Nationwide Advertising Services (1985) and Darlynne was the Senior Graphic Designer and Illustrator. She was not only my mentor but my friend as well. She is an amazing person. There is nothing this woman cannot do. She has an exceptionally generous spirit and it is a real pleasure to know her. It was with great sadness that I heard about her bout with cancer. It was a shock to see her so diminutive and frail. However, true to spirit, she is a fighter. 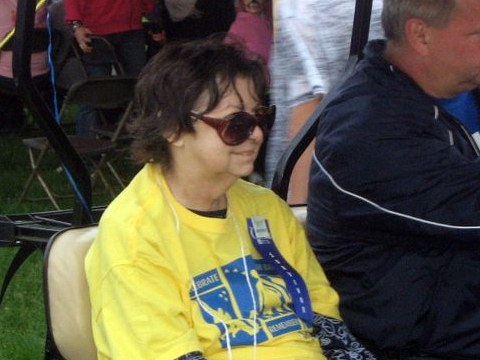 I feel blessed to know Darlynne and to be counted as one of her friends. It drives me crazy that my husband and son leave the pop cans on the coffee table. I call the cans "Tin Soldiers" and often remind them to get rid of the Tin Soldiers. They know exactly what I mean. This is called Intruder because of the one Diet Coke can in the midst of the Dr. Pepper cans. As the second image in the sketchbook I got a little carried away an added more detail to this drawing than I had originally intended. This image is created with coloured pencils. 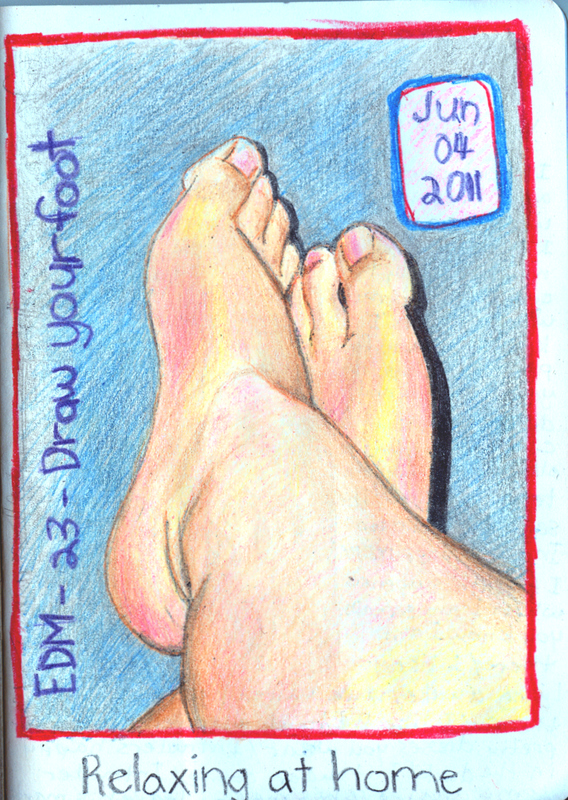 First drawing in my sketchbook for The Sketcbook Project 2012 is of my feet. This allows me to start this project somewhat relaxed. This was created while I sat on my sofa with my feet up. Original self portrait draw with pen and ink, then scanned and manipulated in picnik.com. Finally, it was printed on a clear label sheet, cut to size and pasted on the sketchbook cover. The white areas were painted on the underside of the clear sheet (the sticky side) with liquid paper before pasting it onto the front cover of the book. 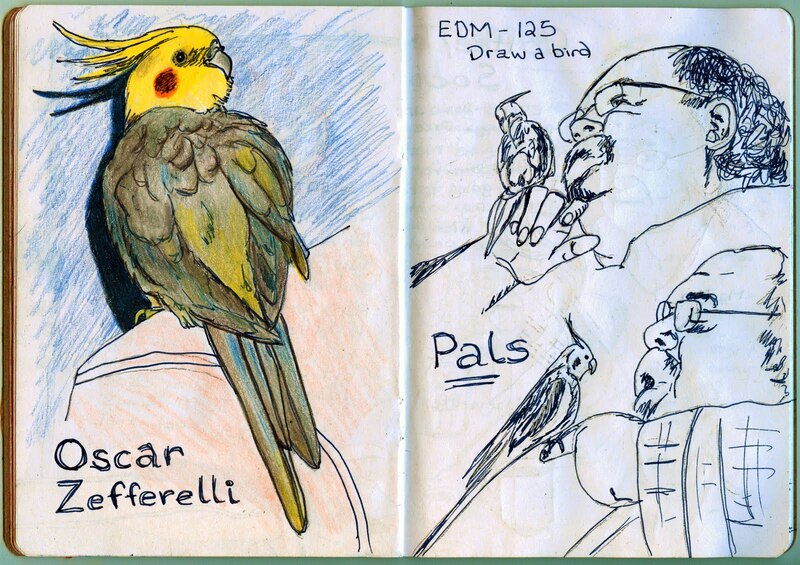 For the most part, this sketchbook will incorporated the Everyday Matter challenges, while documenting a small cross-section of my life's timeline. It will be a time-capsule, of sorts. 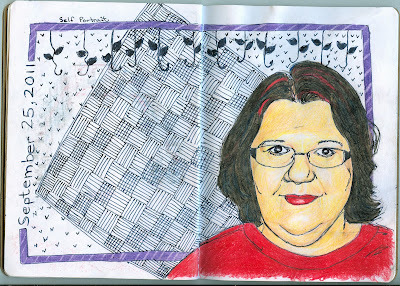 Thousands of sketchbooks have been sent all around the world to people who have signed up to participate in The Sketchbook Project 2012. 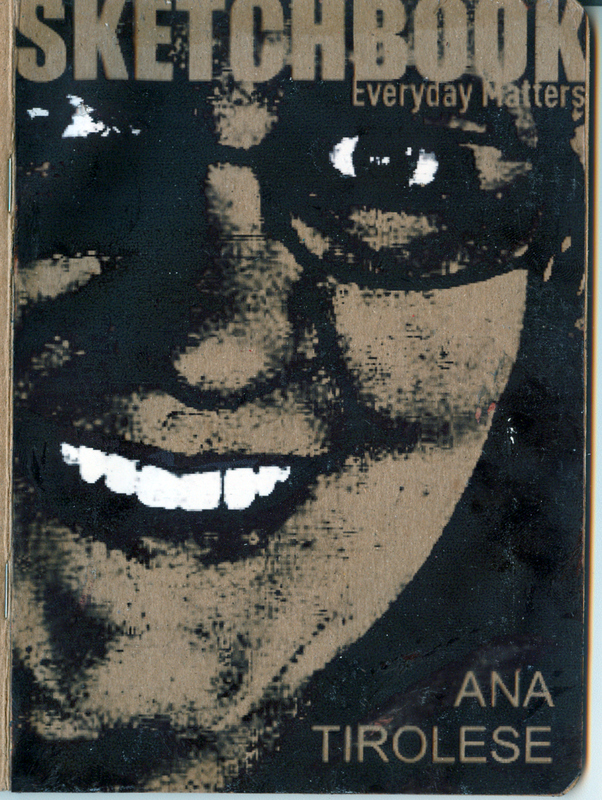 The books that are returned by January 31st, 2012 will be part of a traveling world exhibit. Once the exhibit is over the books will enter into the permanent collection at The Brooklyn Art Library. If you need to sign up by October 31st, 2011 if you want to participate. 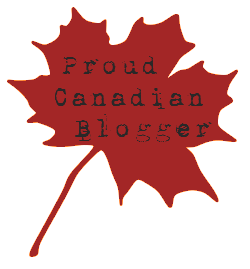 I will be sharing my entry on this blog over the next few weeks. I will attempt to make most of my pages coincide with EDM Challenges. 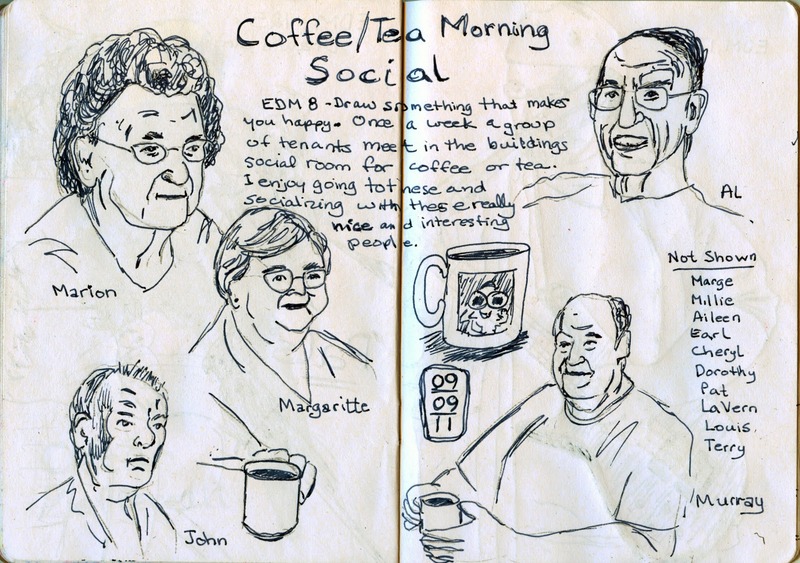 Everyday Matters is a friendly group of people of all ages, cultures, ethnicities, and experience / skill levels that enjoy keeping illustrated journals. This community of artists, from beginners to pros, stimulate creativity by encouraging daily drawing in journals. There are challenges to help inspire ideas. As of this writing there are 323 challenges posted in the EDM Facebook Group. New challenges are added regularly. This group grew out of Danny Gregory's website. These are photos of my new spice storage system. It has created extra space on my counter and in my cupboard. To make this I attached a piece of sheet metal (2"x48"x1/8") to the underside of the cupboard (I used Elmers Ultimate Glue and had it held in place for 24 hours with c-clamps... I put paper down on the counter and sink to catch drips). 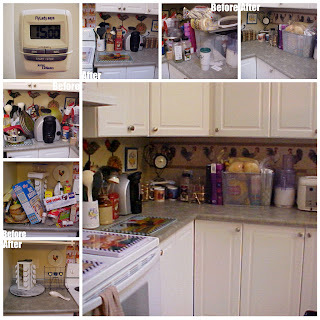 Strong magnets were attached to the lids of spice jars using a hot glue gun. I wrote the spice names on address labels and pasted them on the jars. When all was dry, the jars were attached to the underside of the cupboard with the magnets. They are easy to retrieve when needed and easy to put back when finished. Currently there are 20 spice jars (seen here) but I have room for 7 more on this piece of metal and will be adding at least 3 more to this group. 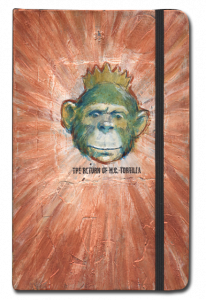 I really like how SketchBob.com presents his sketchbooks. I find the layout visually appealing. 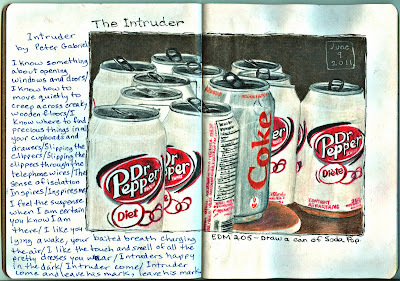 It is also very interesting to go through his sketchbooks. 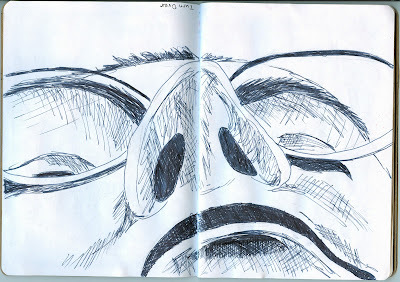 I had the feeling the my own sketchbooks are so tame compared to his; his work is vibrant, bold, exciting! My work is more me, quiet, unassuming, sentimental. Is one better than the other? No, they are just different: different people, different media, different personalities. Normally, I try not to compare other people's work to mine as there really is no comparison, being that we are all unique and our works reflect our own perspectives, personalities, and visions. 10...So planning dinner wouldn't mean deciding between the drive-through for burgers and fries, or waiting an hour for pizza. 9...Because we lost our crock-pots in the kitchen...while we were cooking dinner in them! 8...Because we were tired of hanging up the world atlas and handing over darts whenever anybody asked "Where's the peanut butter?" 7...Because we didn't want to have our names legally changed to "Franny"
1…SO PEOPLE CAN'T WRITE IN OUR DUST!!!!! ...Because our cats woke us up meowing and marching around with a sign that read, "Emptying the Litter Box is Not Optional!" ...So when we told the kids we were eating at the table instead of the living room floor, we could hear "Oh, Cool!" ...Because it was so easy to get distracted by the many fascinating things to do in (your State or Province here)! We understand the Power of 15 Minutes! June 6, 2011 marks the 24th year of marriage to my Sweetie, Anthony. Today is Easter Sunday. It is the day that we Christians believe that Jesus resurrected from the dead. Jesus died for our sins on Good Friday and was resurrected on Easter Sunday. Whether or not you believe that, or whether you just use Easter as an excuse to over indulge on chocolate, I still wish you a Happy Easter. There are plenty of sites out there with the Easter story so I will not go into here. If you are interested in knowing more about Easter you can google it. If you are not familiar with Easter traditions then please do google it and enjoy reading about the many ways Easter is celebrated around the world (as well as the original story). I come from a Portuguese tradition and my husband from an Italian tradition. Being Canadians now, we bring a bit of both cultures, plus incorporate the tradition of hidden eggs for the boy. Mostly it is about food. We enjoy edible treats from both Portuguese and Italian traditions as well as chocolate. Later I will roast a chicken (sometimes turkey) and have stuffing, potatoes, and other yummy treats. This year I did not get a pumpkin pie (or make one). I am trying to cut back on all the sweets. It is a quiet day, watching religious programming on the television, and enjoying each other's company. Check out what's new at Gift Baskets by Design. Angie Wilson from Gift Baskets by Design has some new and wonderful products in her store. She is more than just gift baskets. There are wonderful products you can get from Angie on their own, without being in a basket. Angie does a wonderful job in creating custom gift baskets for any occasion. I have been both a recipient and a giver of her wonderful baskets and have never been disappointed. She really takes care to create wonderful, one of a kind, gifts just for you. She can work with any budget too! Easter is coming up, and so is Mother's Day. I have received and/or given gift baskets for birthdays, anniversaries, funerals, and baby showers. Really, any occasion you need to let someone know that you are thinking of them and care is a great occasion for a gift basket from Gift Baskets by Design. FlyLady says that "you can do anything for 15 minutes". I love just about everything about FlyLady's system. However, one of my favourite things is the use of the timer to help keep me focussed. One of my problems is that I am easily distracted. I will start on one project, think about something else, go do that, think of something else, start on that, and so on. Before I know it I have worked myself into exhaustion and have finished nothing all day to show for my efforts. The timer helps keep my focussed on one project/job/task at a time. 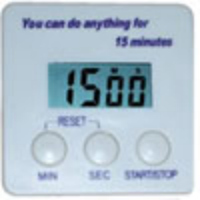 On days that I need to complete a lot I will set my timer for 15 minutes and work on one task for the full 15 minutes. I will stop that task when the timer goes off and move on to another task. This usually happens on good days, where the pain is tolerable. I will work on one task, for example, clearing clutter in one room, then I move to 15 minutes doing computer work, then 15 minutes cleaning a focus zone, then 15 minutes reading. I try to alternate from something physical to something sedentary, and including a 15 minute "break" every third 15 minute session. This is what I call my 15 minute day, and I find that I am most productive these days. If I am working on a web job or a portrait, 15 minutes does not give me enough time to really get into the zone, so I will set the timer for an hour or two. This reminds me to get up and stretch. Another way to use the timer is to force myself to do something that needs to be done but that I really don't want to do (or feel like doing). I can do anything for 15 minutes (or 10, or 7, or 5). If I really don't want to empty the dishwasher and refill it I will set the timer for 15 minutes and go to it. Funny thing, I can usually have it all done in less that 4 minutes. Ironing is something I detest and avoid if I can. However, if I have to iron, I will set the timer for 15 minutes and iron until the timer goes off, then stop. Quite often I am finished before the timer goes off. The timer can be used to help me focus on one job/task at at time, and it can be used to get me to do a job/task I hate or am avoiding. Either way, the timer is my best friend. This year FlyLady says "Go for 7 in 2011" so if 15 minutes is too much, go for seven minutes! In most homes, paper causes clutter. And it seems to mysteriously multiply by itself. 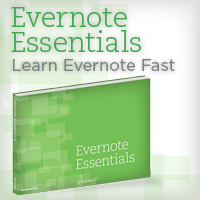 But just how long do you need to keep all those receipts, bank and credit card statements and other financial papers? Below is a handy reference that you can use for dealing with your home paper trail. In the US, the IRS has 3 years to from the date you file your tax return to examine your return for errors and up to 6 years to audit your return if they suspect that you have underreported your gross income by 25% or more. There is no statute of limitations on an audit when deliberate fraud is suspected. In Canada, CRA advises you to keep your tax returns, Notices of Assessment, and all supporting documentation for 6 years from the date of filing your personal income tax return. NOTE~I recommend keeping these indefinitely because they take up little space and can often be a valuable resource if there is any dispute over such things as income tax paid, child support/alimony paid or received and pension plan benefits. Now that you know what to keep, where are you supposed to put it all? Set up a simple home filing system to cover the basics, and invest in a couple of sturdy cardboard or plastic filing boxes for the information you should keep log-term or indefinitely. And a final caution - when you decide that you no longer need to keep certain documents, make sure you shred them and DO NOT put them in the general trash or recycling. Sensitive financial information or personal information should always be DESTROYED to avoid any chance of identity theft that could lead to headaches greater than you can imagine.